Have you ever had to walk by a screaming street evangelist? You know, the person, or people, shouting at everyone about their sinful ways and how everyone is doomed to an eternity in the fiery pits of hell. Or some kind of equally shocking and troubling message. Often they have pamphlets full of nightmare-inducing images or are holding a disturbing sign. While I was in college for my undergrad degree, there was a man who infamously stood, or rather paced, a small area in the center of campus yelling his religion. The vast majority of students kept in ear buds pumping music at full volume to drown him out while they walked right on by; others, like me, would take serious detours whenever possible to completely avoid the area. Even as a firm believer at the time, his technique embarrassed me. I was embarrassed for myself, for him, and for those who did not believe and now saw religion through his invasive approach. While the point - attempting to save souls from eternal damnation -was one I agreed with, the method was an automatic turn off to too many. And for some, it left a horrible taste for all believers, no matter what. It does not surprise me that many people end up with the idea that religion is something they will avoid at all costs because of such encounters. As you can guess my days of undergrad are long gone. I am more comfortable in my beliefs. I doubt I would avoid such an outspoken evangelist now. But the question now is, if we, as believers, need to avoid the invasive, hit-them-over-the-head-with-scary-truth method, what should we do? We have been charged to take an active role in guiding all people back to their Creator God. However, I know many, myself included, who are just not sure how to even take a single step towards going and making disciples. Since we know this is a command from our Lord Jesus Christ, then we have to find ways to obey. Let's check out this idea of how to take one step at a time in obedience. 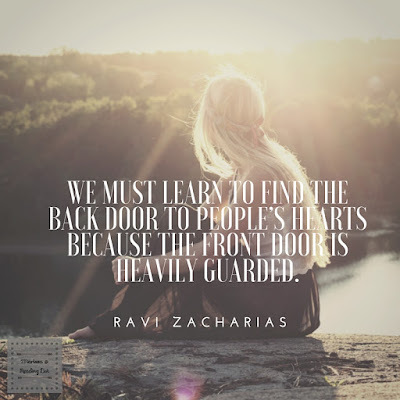 Ravi Zacharias said, “We must learn to find the back door to people’s hearts because the front door is heavily guarded.” It is probably fair to say that the front door is heavily guarded because of experiences like the screaming evangelist, or the long lists of to-dos from a person’s childhood church, or even the lists of do not's. The thing is if we get caught up in trying to accommodate for all the what ifs we will never do anything - we won’t be active. The weight of the what ifs will paralyze us, so we have to give the uncertainties of future possibilities over to our God and take a step in faith. This place of knowing is where I sat for a while. 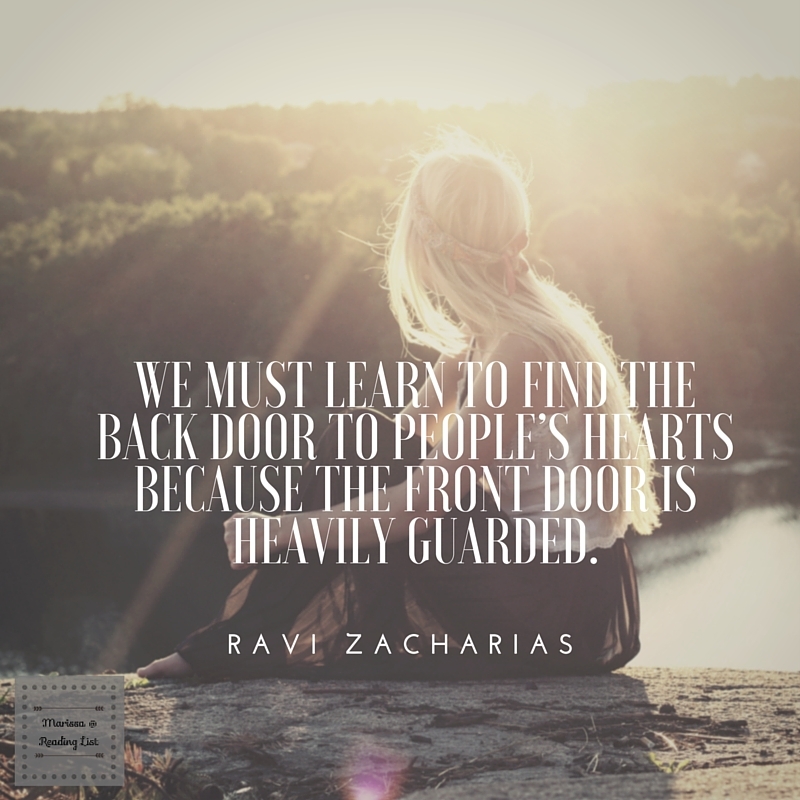 I knew I needed to be intentional, and active, but how does one reach out to those who have put up walls? How do we actually and practically take a step in obedience to this command of leading people to Christ? It is the go to for the majority of people in a given circumstance - at least for this purpose, it is best to think of it that way. Alright, no problem, I thought, I can totally do that. I am a people watcher and a thinker by nature. I started watching and thinking. 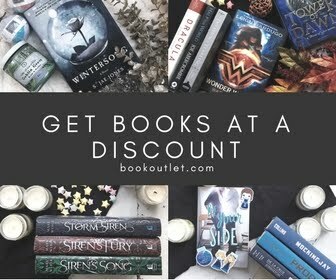 Do you know what I discovered? Step one in actively reaching out to make disciples means you, and I, have to search out people in every area of your life who are not-yet believers - meaning they do not know God or are not saved (depending on your personal lingo). If you are like me, and unsure what areas there even are in your life, think your family (start with your immediate family and work out to distant relatives), think friends (actual friends you see, or could make a point of seeing as well as all those “friends” you’ve picked on social media), think work (for those who are stay at home mamas, or work at home mamas - think of those other moms you see pushing strollers in the park), think school (yours if you are in classes of any kind, and your kids’). Just start breaking down your areas of life. And if, like me, you cannot think of a single person you can name as a not-yet-believer, pray that God will show you one. (Take your time here, pray, listen) Once you have your list, actual names here, start praying- for them, for you, for your time with them, for God Space. Here’s where it gets tricky. How do we even start to move towards that back door? The first practical step is to schedule your life to allow for interactions with the people on your list. Call up those friends and schedule coffee dates. Plan on going to the park during peak hours and then say hi to those other mamas you see often. Call that aunt or cousin you only see once during the holidays just to say hi. Do not plan on saying anything drastic. Just be open to having a real conversation about something they are comfortable with. The second practical step would be to start asking wondering questions as applicable. Wondering questions are a result of engaging a person in a conversation they are interested in, and then really listening. Doug Pollock calls this “Spirit-led listening”, because while you are listening to your not-yet-believing friend, the Spirit will start pointing out aspects of what they are saying that will alert you to the deep need inside of them to be found in their Creator. But instead of shouting at them about the state of their soul, you can ask a wondering question that will make them start wondering about real answers - you will simply scatter a seed or water a seed that God placed in their heart. So now you are probably thinking, this is all great Marissa, but how does that look? And how exactly am I suppose to take those steps? Well, first might I suggest getting your hands on God Space? Each chapter will walk you through how to pursue the people in your life, how to engage them in real conversations, and how to ask wondering questions without getting that door slammed in your face. 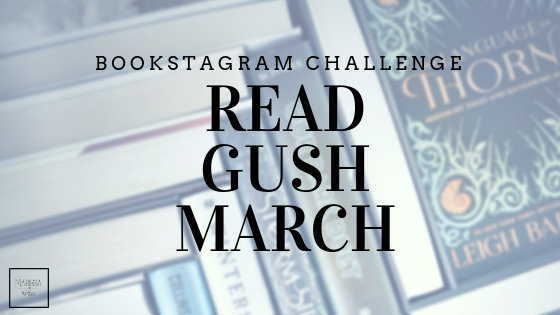 If you are still willing to hear how this form of going and making disciples is playing out in my life and on Reading List, join us next week. How do you feel about the doomsday evangelizing that most Americans know? Are you curious about wondering questions? Does this sound like a form of actively reaching out that you could do? 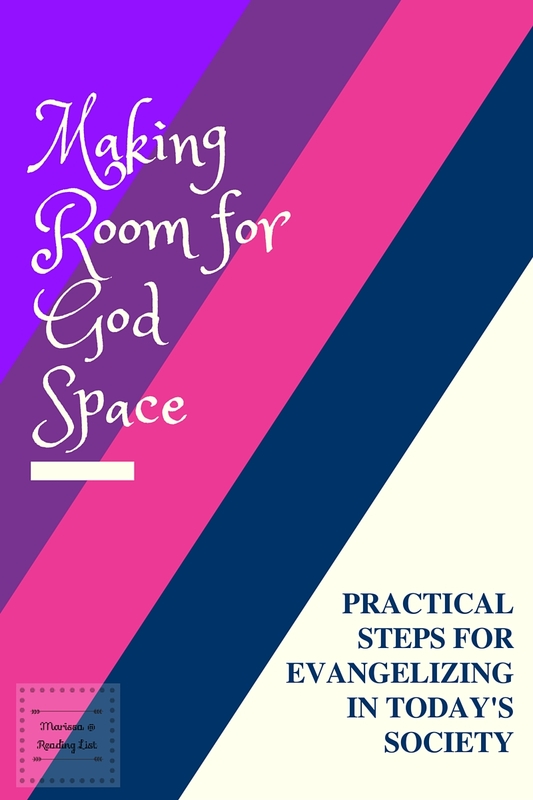 What Steps Will You Take to Allow for More God Space?